Do you want to cut into the wall? If you do, how much depth will you have for the fireplace? Do you want to build the wall out to accommodate the fireplace? If you do, how far into the room do you want to build? Do you want to mount the fireplace on the surface of the wall? Do you want to have a TV above the fireplace? Do you need or want heat from the fireplace? If you plan to cut into the wall, or build out a wall, to accommodate your fireplace, then it’s best to find out how deep your preferred fireplace is. Depths range from 4.25” to 12” for most linear models. If you are limited in the depth that you can achieve in your wall, then it’s best to know that before you go shopping. There are many contemporary electric fireplaces that mount on the surface of the wall. While many people assume that these can also be inset into a wall, this is usually not the case. Most units are designed to be either in the wall or on the wall, but not both. Surface-mounted fireplaces will generally project 4.25″ to 6.5” into the room. The advantage of surface-mounting is that these units may be removed from the wall when you move, or repositioned to another spot in the home, without leaving a gaping hole in the wall. It’s also much simpler to install a fireplace on the surface of the wall rather than having to cut through studs and reinforcing the wall cavity in order to mount in the wall. Either way, the electrical outlet will be needed close to where you want to plug in the fireplace. If you prefer a fireplace that offers heat, you will have to consider where the heat is blown out of the unit. A fireplace that’s designed to go into a wall or cabinet, will expel the heat out a vent in the front of the unit. 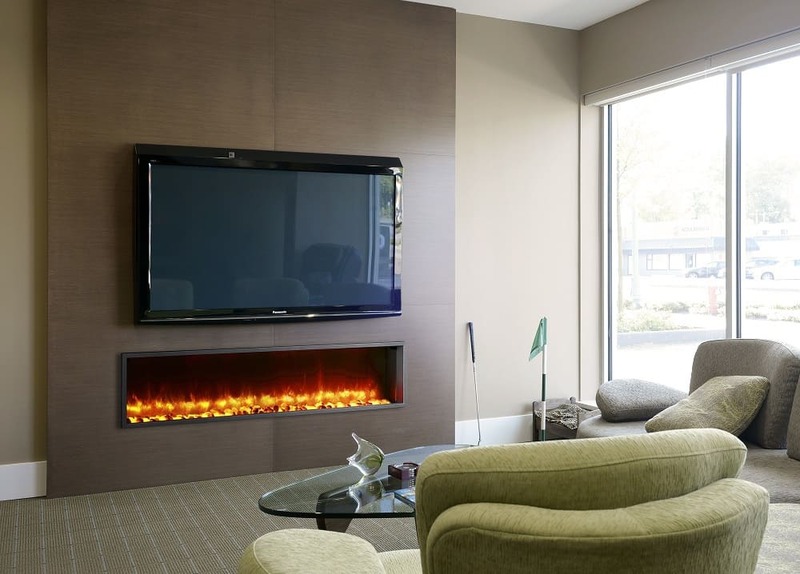 A fireplace that’s designed for surface mounting will expel heat out the top or the bottom of the unit. If you wish to have a TV above your surface-mounted fireplace, then you need to ensure that heat is blown out the bottom of the fireplace, and not the top, where it will directly affect the TV. There are very few electric fireplaces that have no heater, so it’s best to be knowledgeable about the unit you are purchasing. We’ve created a quick video on how to tell whether a wall-mount fireplace may go into a wall. 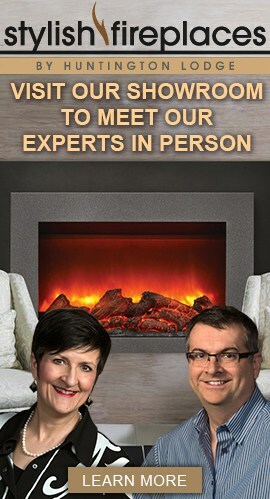 Stylish Fireplaces & Interiors specializes in electric fireplaces in their GTA showroom. They also offer custom design services to complete the project. This entry was posted in Electric Fireplaces, Fireplace Design and tagged contemporary fireplaces, electric fireplaces, fireplace design, flush-mount fireplaces, linear fireplaces, modern fireplaces, wall-mounted fireplaces.